Gasp! A post on a Monday? Can this be? What's the special occasion? For the next two weeks, I'll be spending the majority of my week nights acting as a production assistant of sorts as we shoot scenes at the lab for a handful of promotional videos, and seeing as HR is cracking down on the whole "no open-toed shoes at work" rule, I had every reason to run to Baker's in search of comfortable flats. Which I found yesterday. And dearly love. The sacrifices I make to advance my career, I swear. Since I was already at the mall, I figured I may as well redeem the twenty-dollar coupon I recently received in the form of a heartfelt, emotional postcard from my dear friend, New York and Company. The end result? Well, let's just say I didn't cry on the way home. Do you see those beautiful, work-appropriate, drawstring pants that do not require the suffocation of my stomach via tummy tube? (Can you tell I'm not a fan?) They're a little roomy right now, so I figure I've got at least a month before I'm too fat to squeeze into them. 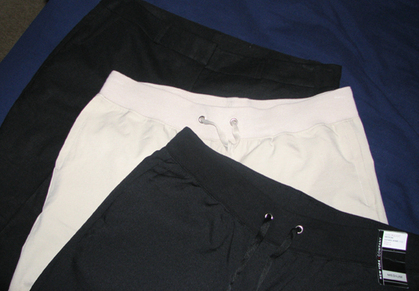 The other pair has little snaps I can leave undone when paired with a loose-fitting shirt. Plus, I can wear all these babies again this time next year because all the baby weight will have totally melted away by then, and if you try to insinuate otherwise I will totally ban your IP address. I love those shoes and NY&Co. almost as much as I love you. I have one pair of black flats and they make my feet so happy. Would it be weird if I said you have nice legs?? Cuz from what I can see of your calves in that photo, you do. And my belly is jealous of those yummy pants. They look COZY! For some reason, I just cannot buy flats! I will wear some flip flops, but I don't know why I am so afraid to try flats! Those are super cute though! Dude, you're not even gonna have baby weight to lose! The shoes are adorable! And NY&Co is so awesome. I haven't been there in forever, as I kind of had to cut myself off at one point. I am lusting over those shoes! Like everyone else: I want those shoes on my tootsies! Baby's Mommy got a new pair of shoes. Safety first at work or any where is a good idea. Your new shoes are very cute. Hey, the pink socks on little Frema go with the pink shorts. Of course, little Frema is cute too; look at her sweet smile. The shoes look so cute on your feet! I love the cross straps. Love the new shoes and I definitely think you'll be back to your fighting weight by then!